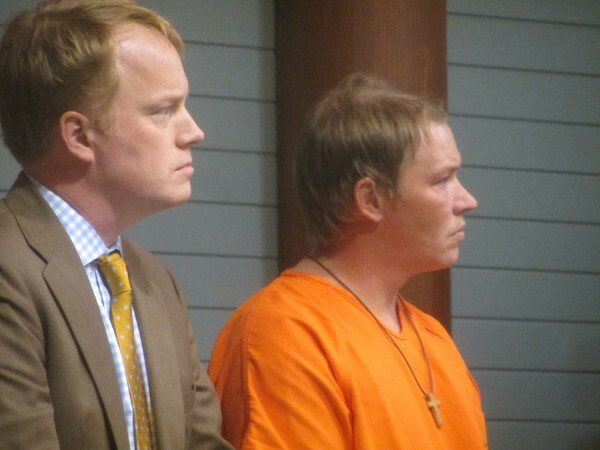 Sheldon W. Curtis (right) made his initial court appearance Monday in Knox County Unified Court. He was represented at the hearing by attorney James Mason (left). ROCKLAND, Maine — A Rockport man remains in jail after police said he threatened a woman Saturday afternoon by putting a knife to her throat. Sheldon W. Curtis, 29, is being held at the Knox County Jail in Rockland on charges of domestic violence criminal threatening with a dangerous weapon, domestic violence reckless conduct with a dangerous weapon, and domestic violence assault. During his initial appearance Monday afternoon in Knox County Unified Court, Judge Susan Sparaco set bail at $5,000 cash if Curtis can get a Maine Pre-Trial Contract or $7,500 cash if Maine Pre-Trial does not accept him into the program. A motorist contacted police after witnessing the alleged incident, according to an affidavit filed in court by Knox County Sheriff’s Office Deputy Arthur Smith. The witness said she was driving on North Shore Drive in Owls Head shortly before 3:30 p.m. Saturday when she saw a car stopped in the road. The woman heard the stopped car’s horn and pulled over to see what was going on. When she approached the car on foot, she saw Curtis holding a knife to a woman’s throat, according to the affidavit. The woman in the car was scared and crying, the witness reported. The witness then heard the man order the victim to drive off and then she did. Police located the vehicle on Limerock Street in Rockland. The victim did not cooperate with police and Curtis denied threatening her with a knife. He claimed they had a verbal argument. Police reported finding two knives outside near where Curtis was located. Assistant District Attorney Christopher Fernald pointed out to Judge Sparaco that Curtis has a lengthy record dating back to 2002. He has been convicted of felony drug, theft and operating a motor vehicle after revocation charges, as well as several violations of bail, probation and failure to appear in court. Defense attorney James Mason asked the judge to have Curtis released on unsecured bail. He said the victim denies the offense occurred and questioned how good a look the witness had at what was occurring.